You’re printing a draft of your Great American Novel, but you don’t want to make it look like a manuscript. No, you want it to look like it would when it comes out in print, on smaller-sized sheet of paper, but you don’t want to waste paper by printing it too small on a page. The solution is to use a Word feature that lets you print multiple pages on a single sheet of paper. A page is a Word-thing. It’s the virtual page you see on the screen. The page has a size and margin, header and footer, and in the center is the text you compose. A sheet is a sheet of paper. It comes out of the printer. Normally, pages and sheets are the same thing: You format a page in Word to match the paper (sheets) stocked in your printer. That limitation doesn’t need to hold, however. 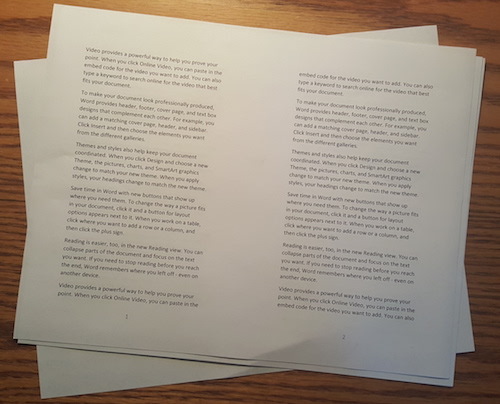 In Figure 1, you see a sheet of paper with two pages (from Word) printed side-by-side. Each page has its own footer; you don’t see a big footer on the center of the page. Some other things to notice about the sheet: The paper is oriented horizontally. The pages are vertical. A margin or gutter is set between the pages. Figure 1. Printed output from Word, two pages per sheet. 1. Write and save your document. I strongly recommend that you write the entire document first. Worry about formatting later. 2. Change the page orientation to Landscape: Click the Layout tab, and in Page Setup group choose Orientation, Landscape. 3. Click the dialog box launcher in the lower right corner of the Page Setup group. The Page Setup dialog box appears. And you could have set Page orientation in the dialog box as well, but why be efficient? 4. On the Margins tab in the Page Setup dialog box, click the Multiple Pages menu and choose 2 Pages Per Sheet. The document changes on the screen. The Page looks smaller, similar to what’s shown in Figure 2. Figure 2. 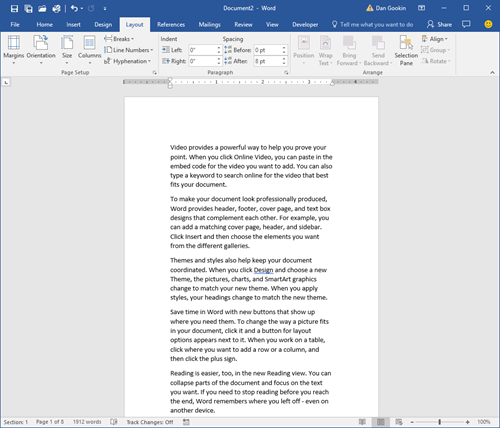 A document in Word formatted at 2 pages per sheet. Remember, what Word shows you are pages, not sheets. In fact, you don’t even see sheets in the Print Preview: Click the File tab and choose Print. You see something similar to what’s shown in Figure 2, but what prints is similar to what’s shown in Figure 1. In fact, Figure 1 is the output of the document shown in Figure 2. To change the document back, open the Page Setup dialog box again and choose Normal from the Multiple Pages drop-down list.